I cook this in a cast iron skillet, although a saucepan or frying pan will do. It needs to have a thick bottom to prevent burning. Use a wooden spatula to stir rather than a spoon because it will stop the sauce sticking to the bottom of the pan. Lidl extra virgin olive oil is my favourite. Don't use the blended muck because it's a really important part of the flavour. A real lemon rather than Jif and proper Parmigiano Reggiano (Parmesan) are pretty much essential too. Dried parsley will definitely do, although obviously fresh is better. Make sure the mushrooms are nice and fresh, they'll soak up the oil otherwise and go a bit slimy. I don't really drink white wine, so I buy those little screw top bottles like the ones you get on a long-haul flight. It'll keep for ages in the fridge if you put the lid back on. Grate the Parmesan directly onto the food for that lovely cheesy smell. I don't use a lemon squeezer but just squeeze it over my hand, letting the juice run through my fingers to catch the pips. There seems to be debate about whether to add oil to the pasta water. I do, but not to stop it sticking as everyone seems to believe, but because it stops the boiling water splashing everywhere ("pour oil on troubled waters...") and means you can boil it faster. I also add a good pinch of sea salt. The most important thing is to cook it in as much really boiling water as you can and not overcook. I invariably go for the shortest cooking time on the packet and sometimes even shorter. Use a timer! Start by weighing out the pasta and putting the water on to boil. You want to aim for putting the pasta in the water at about the same time as you add the cream to the sauce, so read through this before you start. Peel the garlic, crush with the back of the knife and finely chop. Clean the mushrooms and slice quite thinly. 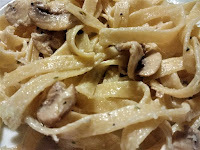 Put a good slug of olive oil in the pan, put the heat on and add the mushrooms and garlic in that order, sprinkling the garlic over the mushrooms. When it starts to sizzle, turn it down a bit until it's cooking quite quickly but not like frying mushrooms for breakfast. You don't want to burn the garlic because it'll go bitter. Stir frequently and don't leave it alone because it'll go suddenly overcooked if you do. Once the mushrooms are cooked - they want to be kind of floppy but not really brown - pour a little white wine in. It wants to be enough to cover the bottom of the pan, that's all. Leave it a minute or two until the bubbling has subsided a bit. Now is about the right time to put the pasta in; throw it in the boiling water, bring it back to the boil, stir with a fork and put the timer on. Pour the cream onto the mushrooms. The idea is to have enough to coat the mushrooms once it's reduced a bit, but not so much that they're swimming in cream, or it'll taste like a dessert. Now is a good time to add the parsley. Gently boil for a little bit stirring frequently until it's thickened, then season with sea salt and ground black pepper and taste. Stir in the lemon juice; you need to stir pretty frantically to stop it curdling the cream, which by rights it should do. Stir well and keep on the heat for a bit though and it'll all combine nicely. As soon as it looks ready turn the heat off. There shouldn't be too much sauce - it wants to coat the pasta, not be like soup, and smooth pasta like tagliatelle can't take too much sauce. As soon as the timer goes off, drain the pasta into a colander or sieve and immediately tip it back into the pan. That way it retains a bit of the water and you don't have to go through all that palaver of retaining the water and using it to 'loosen' the sauce. Toss it in a little olive oil, add the sauce and stir it in. I do this on the cooling ring which makes sure it's nice and hot, but do it quickly. Serve immediately on warm plates or bowls. Grate fresh Parmesan over; perhaps eat it with the rest of that white wine you opened.